There’s a class of sailor who crave the most intimate and frightening of off-shore adventures. Simple racing is not enough for them. What they want is a challenge so great and so ill-advised that just to complete the race brings a nautical gravitas that can never be lost. In fact, just having raced a leg in this nine-month race is bragging rights enough. 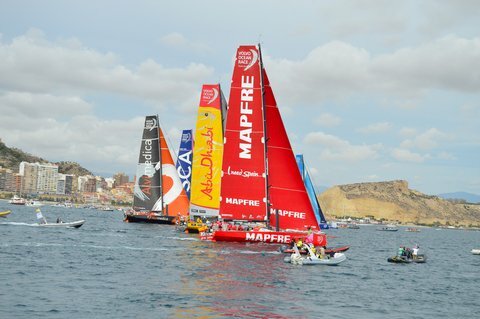 The Volvo Ocean Race, held every three years, crosses four oceans and five continents over nine months. The most recent trials ended in June. Beginning in Spain, racers sail down to South Africa then Abu Dhabi and China, New Zealand, Brazil. From there it’s north to Rhode Island and then across the Atlantic ultimately to Sweden. Consider this: in some parts of the southern oceans, any help required by a stricken craft would take three days travel. So those poor sots are left afloat for three days from the distress call. Three days is how long it took astronauts to reach the moon. That’s remote. If you get knocked down out there, you might as well be on the moon. The boats that skippers use in the Volvo Ocean Race have evolved to a one-design class. The new Volvo Ocean 65 Class has been designed, engineered and built to be a high performing and competitive race machine. These 65-foot yachts carry state-of-the-art features that make them fast, rugged, and a lot of fun to sail. Some off-shore sailors will spin yarns of riding massive waves, liquid mountains, for hours, with only the reaction of the foredeck crew looking straight up to know when a following sea will hammer another wave over the transom. Others talk of spending their days below decks, in the Spartan quarters, sewing ripped sails back together while the boat bucks and rolls her way windward. These yarns are true. And that is the essence of the sport.